"We were in the weekly commanders' conference at Kochi when a call came from the Coast Guard office in Mumbai to send the best team near the dam where water was flowing above the danger level," Lt Col Shashikant Waghmode said. Lt Col Waghmode, an assault engineer officer, currently on deputation to the Coast Guard, volunteered to lead the team and within 30 minutes, the team members were selected. 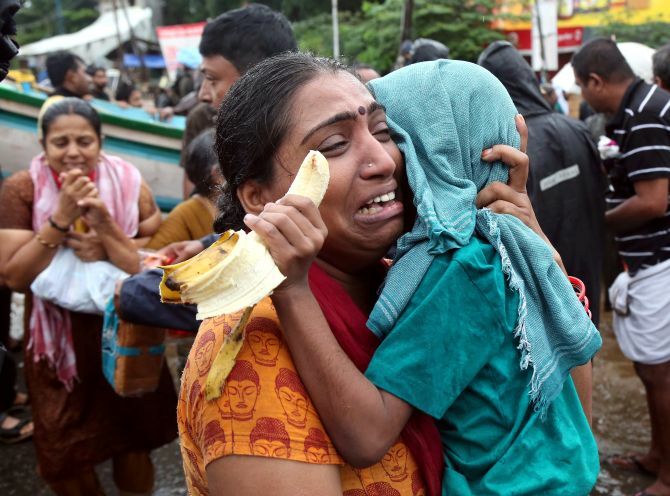 In Idukki, they found that all the villages were evacuated and hotels, shops, ATMs and petrol pumps were shut. There was no place to take shelter, he said. "On August 16 night, just as we reached an abandoned government hospital for rest after four days of non-stop work, the local police officer, villagers and NDRF (National Disaster Response Force) officials came to us, asking to save the life of a woman who had just given birth," he said. The team then launched a night-long rescue mission, calling it 'Operation Water Baby', Lt Col Waghmode said. The woman's house was two km from the point where the rescue boat was unloaded, he said.